The country is once again in the grip of authoritarianism and political violence, the roots of which run deep. The announcement of the schedule for elections to the tenth Jatiya Sangsad (national parliament) on November 25 has stoked an already volatile political situation in Bangladesh. 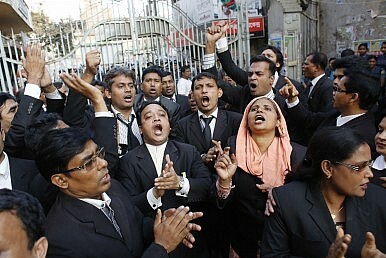 The ready reaction of the Bangladesh Nationalist Party-led opposition alliance to the chief election commissioner’s televised speech to the nation, during which he announced that the general elections will be held on January 5, 2014, came in the form of what was initially a 48-hour countrywide blockade of road, rail and water ways, subsequently extended to 71 hours, beginning from November 26. The blockade ended on November 30, but the BNP commenced another 72 hour countrywide blockade the next day, which was ultimately extended until the evening of December 5. The alliance has called for yet another blockade to begin on Saturday, December 7. In the meantime, there has been widespread violence and vandalism: vehicles are torched, public and private property destroyed. The death toll as reported on December 4 had reached 40 and scores more have been wounded. Many of the casualties were caused by an explosion of crude bombs and arson attacks on public transport. According to Samanta Lal Sen, the coordinator of the burn and plastic surgery unit at Dhaka Medical College Hospital, the premier public hospital in the country, several of the victims of political violence, admitted with severe burn injuries in the last one month, had died and quite a few are in a critical condition. The BNP-led alliance has been engaged in street agitation for months now in its demand that Sheikh Hasina resign as prime minister, given that her Awami League government completed its term on October 25. The opposition alliance claims that polls conducted under the government will not be free, fair or transparent. While the two sides continue their finger-pointing over the ongoing political impasse and social disorder, arising out of the failure of the ruling and opposition political alliances to reach a consensus on election-time government, there have reportedly been informal contacts between the feuding camps, supposedly geared towards a dialogue. Still, publicly at least, the two camps have thus far produced only contradictory statements about what the media has dubbed as “clandestine” meetings between the general secretaries of the Awami League and the BNP. The Hasina-Zia feud threatens to return the country to military rule.